Upon arrival our guests will find what you need to prepare a lunch, a dinner, a breakfast and a bottle of wine we produce. Cooking classes can be booked with a mother tongue teacher at her school . Also you can book food and wine tours, truffle research in the farms near Casa della Nonna. You can enjoy a magnificent view of the Crete Senesi with beautiful sunsets. The gaze is lost in the colors of the Tuscan countryside and the silence broken only by birdsong. You can book cooking lessons with a teacher at his school and also tastings of wine, cheese, and even truffle hunting at local farms. Amazing property and awesome family! We really enjoyed our stay at Montechiari. Angela's daughter Adele met us with a smile and was very helpful, cheerful, and informative. They helped us with information on a wine tasting, restaurants, etc. Angela and her husband were very kind and happy. This place has beautiful views over the fields of Tuscany. It is in a great location outside of the touristy areas, yet only about 5 minutes to a small town for supplies/coffee/etc. It was easy to tour the towns of Montepulciano and Montalcino in about 20 minutes from here. If you would like to stay away from the busy tourist area in a beautiful place, I HIGHLY recommend staying here! We also shopped for food at a nice supermarket in a nearby town and cooked breakfasts and dinners. We can't wait to come back and share this amazing spot with more friends. A beautiful farm house with 360 degree views. A warm welcome awaits at this very quiet home. Hearing the bees, birds and the occasional tractor go by. Our apartment was spotless, with fresh linens including a few flowers. Our hosts Angela, Alexendro and Adele were amazing. They were always there when we needed them. We cannot thank them enough for all of their help and kindness. One week was not enough. Peace and quiet is guaranteed. To see the stars at night without any light pollution is rare indeed. We'll certainly be returning ! thank you for having taken care of my house. I wait for the next holiday in Tuscany! I stayed in Casa della Nonna for a week in May, with a couple of friends and I must say that it was an amazing experience. We arrived there on a rented car, and even if there were some problem with the Navigator and were late for the scheduled time with the owners, Angela and her family was waiting us late night with welcome berry pie and all her kindness. Next morning we were able to find out this extraordinary place near Montalcino! One bedroom’s window had a great view over Montalcino, we had our private patio garden with view over the mount Amiata and hills of the Val d'Orcia with scenic farms. Apartments was styled in country style and was very good, and kitchen was well-equipped (but no frills for agrotourism like a dishwasher and washing machine or TV-set). In rainy evenings, we were able to kindle fire and spend a beautiful romantic evening by the “camino”. What definitely added to our stay was the fact that we could eat and drink Toscana wines outside and enjoy the beautiful Tuscan natures - garden blooming acacia and we enjoyed its fragrance. The Casa della Nonna is an oasis of calm and when you take a small walk by country road behind the house you will spot roe deers, hares and pheasant! Place is conveniently located for visiting all the small towns of southern Tuscany: Montalcino, Montepulciano, Pienza. Time to go to Siena is no more than 40 minutes too. We had a very happy and relaxing time staying Casa della Nonna and I would highly recommend it, especially in the spring. We were invited to a wedding nearby this place. We were very positive surprised about the flat. The appartment which we booked is very comfortable and is arranged with much love. The owners are very good and likeable hosts. They looked a few times discreet for us and checked if everything is fine for us. The appartment is in the tuscan hills and you need always a car. Should we plan our Holiday in the Tuscan we will come back!!! Fijn landelijk gelegen huis met 2 verhuurbare appartementen en rondom prachtig Toscaans uitzicht. Functioneel ingericht, alle voorzieningen aanwezig. Zeer gastvrij ontvangst. Lekkere plek om uit te rusten of om op pad te gaan in Toscane. Das Haus liegt auf einem Hügel mit toller Aussicht über die Landschaft der Toskana. Die Wohnung im ersten Stock hat einen separaten Zugang. Unten befinden sich zwei weitere Wohnungen. Die Ausstattung ist gut, sehr sauber und gepflegt. Das Ambiente ist im typisch mediterran-rustikalem Stil. Zwei Schlafzimmer und zwei Bäder gibt es. Es gibt eigentlich nichts, was uns negativ aufgefallen ist. Ein paar mehr Teller und Besteck für Spülfaule wären vielleicht zu nennen, denn man muss spätestens jeden zweiten Tag spülen. Aber das ist ein Luxusproblem. Ums Haus herum gibt es einen gepflegten Garten mit mehreren Sitzgruppen und Liegen. Alles sehr liebevoll angelegt. Wegen der Größe des Gartens und der Lage rund um das Haus hat man auch trotz der beiden anderen Wohnungen seine Ruhe, wenn man diese möchte. Zwischendurch bekamen wir immer wieder Besuch von einer Schafherde die die Wiesen in den Hügeln abgrasen. Aufs Grundstück können sie aber nicht. Auch die Vermieter Angela, Alessandro und Adele sind sehr nett, sehr gastfreundlich und umgänglich. Die Verständigung klappte zwar oft nur mit Händen und Füßen aber das sorgte für allgemeine Erheiterung. Zum Einzug bekamen wir sogar einen selbst gebackenen Kuchen und eine Flasche Rotwein. Uns es wurde uns sogar eine Erstversorgung mit Milch und Saft in den Kühlschrank gestellt. In der Nähe, ca. 10 Autominuten entfernt in Torrenieri gibt es einen kleinen Supermarkt. Allerdings ist das Haus auch mit Navi nur schwer zu finden. Man sollte sich vorher eine genaue Anfahrtbeschreibung geben lassen. Alles in Allem ein Ort um die Seele baumeln lassen zu können und trotzdem mit einer guten Anbindung an viele Sehenswürdigkeiten der Toskana. Siena ist z.B. nur 45 Minuten entfernt. Montepulciano nur 20-30 Minuten. Und in Florenz ist man innerhalb von 75 Minuten. 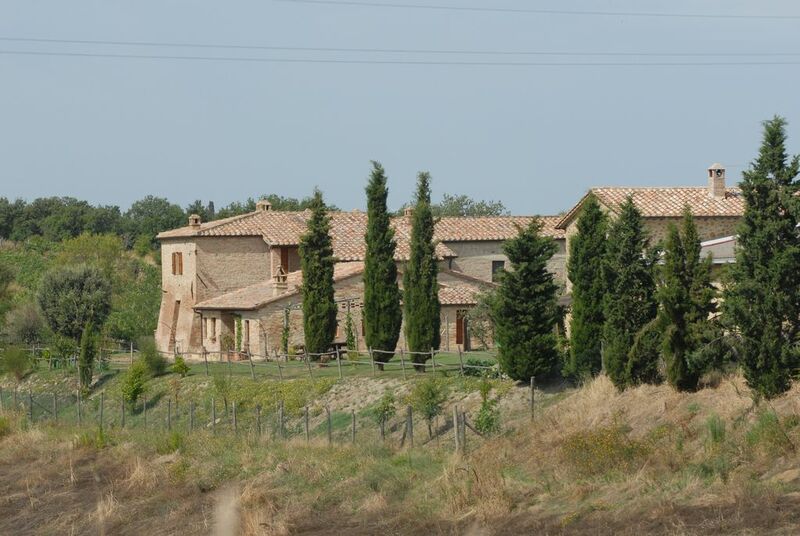 The farm is 15 minutes from Montalcino, Bagno Vignoni. Siena is the other most important city can you visit for monuments and Palio.